Ministry of Health, Ruwi, Muscat, Sultanate of Oman. *Address correspondence and reprints request to: Salem Said Al-Touby, Ministry of Health, Ruwi, Muscat, Sultanate of Oman. Al-Touby SS. 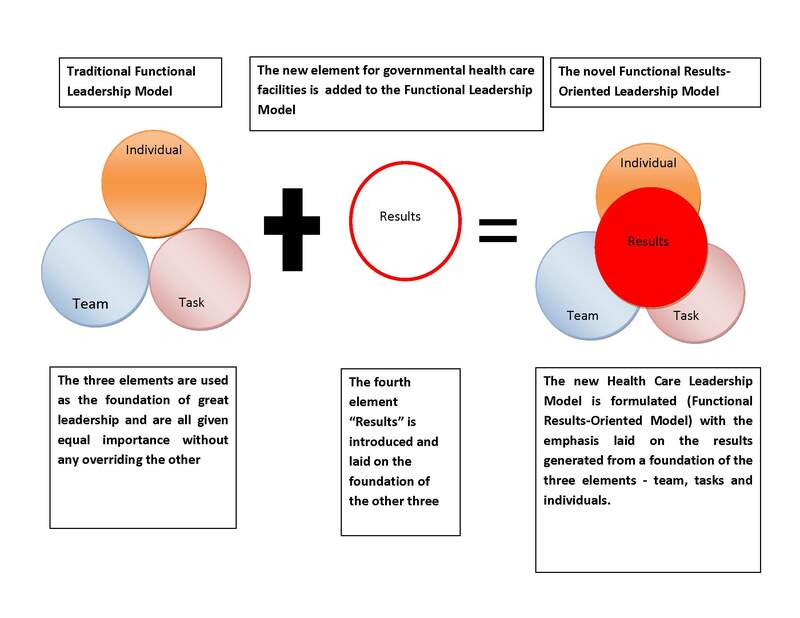 Functional Results-Oriented Healthcare Leadership: A Novel Leadership Model. Oman Med J 2012 Mar; 27(2):104-107. This article modifies the traditional functional leadership model to accommodate contemporary needs in healthcare leadership based on two findings. First, the article argues that it is important that the ideal healthcare leadership emphasizes the outcomes of the patient care more than processes and structures used to deliver such care; and secondly, that the leadership must strive to attain effectiveness of their care provision and not merely targeting the attractive option of efficient operations. Based on these premises, the paper reviews the traditional Functional Leadership Model and the three elements that define the type of leadership an organization has namely, the tasks, the individuals, and the team. The article argues that concentrating on any one of these elements is not ideal and proposes adding a new element to the model to construct a novel Functional Result-Oriented healthcare leadership model. The recommended Functional-Results Oriented leadership model embosses the results element on top of the other three elements so that every effort on healthcare leadership is directed towards attaining excellent patient outcomes. This model is based on three areas, which are seen as core areas in leadership. 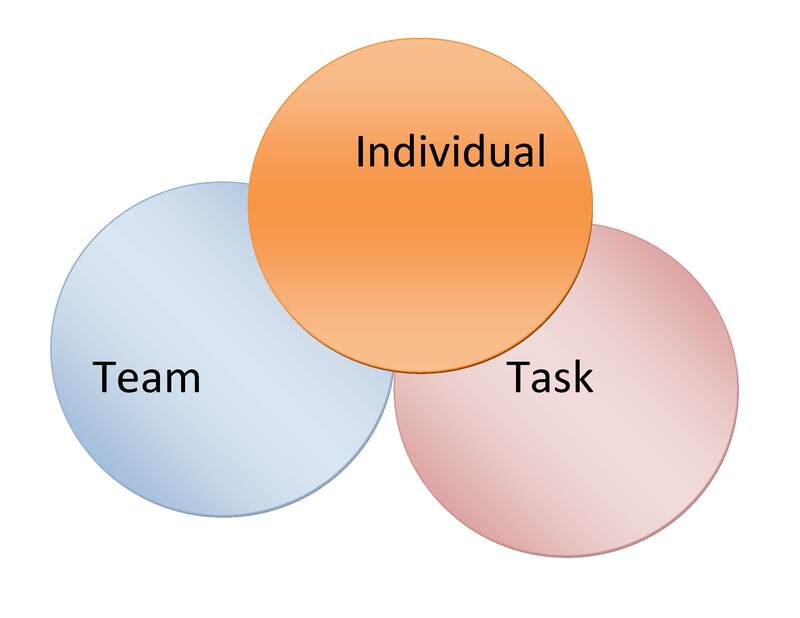 These three areas include the tasks performed by the organization, the relationship of the people working in an organization and the input of each individual working in the organization.3 The relationship between these three areas is in a union as indicated by the following Venn diagram. This model has been used with great success in the British and Canadian military. However, it has come under great criticism by theorists who later claimed that it is an over simplification of the very complex role of leadership.4 According to the theory; leadership behaviors should be divided into three distinct types based on which of the above three areas they prioritize.5 The first type of behavior is substantive, which refers to behaviors that are only directly relevant to getting the organization’s tasks done.4 It prioritizes the task more than either the team or the individual.6 Leaders who prioritize substantive behaviors are always proposing workable solutions or providing crucial information to solve the challenges that lie between the staff and high performance.4 The following Venn diagram can represent this scenario or type of leadership. The second type of leadership behavior focuses more on the group/ team, rather than either the task or the individuals.4 The healthcare industry relies on teamwork to accomplish goals and thus, this aspect of leadership is quite important.7 This type of leadership is called procedural leadership, since its typical behaviors are those that seek to establish beneficial team playing, team exchange and team participation. 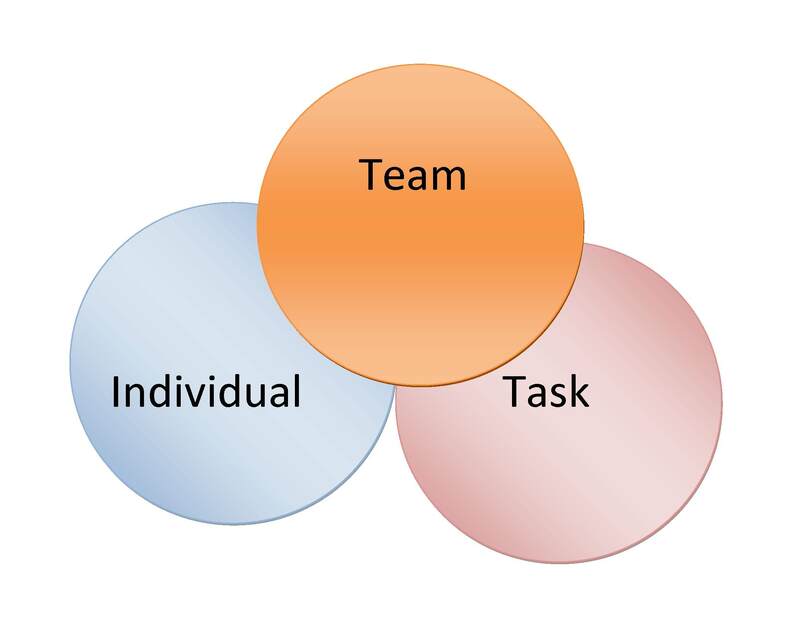 It regards every decision from a group perspective, by developing particular group procedures that help the team members to work together.4,8 The test of good leadership here becomes the level of agreement and relationship among the organization/team members.7 The following Venn diagram illustrates this type of behavior. The third type of leadership, according to the functional leadership model, is maintenance leadership whose typical behaviors tend to prioritize the individual employee or staff member over both the team in which he or she works or the tasks he or she is assigned.4 This type of behavior always strives to improve the individual participation, satisfaction and achievement.9 In a group setting for instance, a maintenance leader will always encourage the silent and shy members to join a discussion. Such leaders tend to satisfy employees first as a way of boosting their performance by developing their skills, giving satisfactory compensation, offering good benefits and counseling.10 The following Venn diagram illustrates this type of behavior. 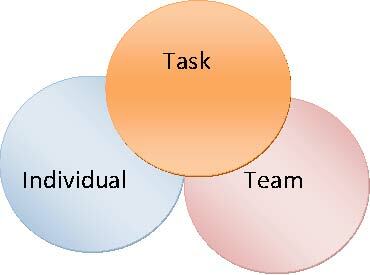 The Functional Results-Oriented leadership model proposed in this article introduces a fourth element that is very crucial in healthcare provision.11 In this model, results become the center circle embossed on the three other circles of tasks, individuals and teams. This model introduces a fourth element that was not conceived by the earlier functional leadership model, one that is of utmost importance in healthcare. The fourth element is results (patient outcomes). The introductory argument helped illustrate how the patient outcomes are the only indicator of good healthcare leadership, since they constitute the primary mandate of every healthcare establishment.13,27 No matter how perfect the healthcare team is; no matter how motivated the care staff are; no matter how well the care procedures are articulated and practiced, the yardstick of good healthcare leadership is patient outcomes, the results of care.22,28 The following diagram illustrates how the Functional Results-Oriented leadership model can work. The conglomeration of the three types of leadership behaviors as posted by the functional leadership model into a singular behavior that uses the team, tasks and individuals to work towards desired results; thus enabling any healthcare professional member to perform effectively in leadership.11 Again, as posted in the foregoing section analysis, healthcare provision must be geared towards getting desired patient outcomes and not the processes of care of the organization structures of a healthcare facility.24,29 This model emphasizes on results, where teams are assigned tasks and individuals are held accountable for their contribution or lack of, to the team’s attainment. Results take center stage in this model. This model is applicable in any size and type of healthcare organization, but particularly for large governmental healthcare organizations. As Shortell (2006) notes, healthcare facilities from governmental, for-profit or not-for-profit, require a similar management structure but for their operating principles.13 Although the aspirations and targets may differ, the mandate remains centered on patient care. The greatest advantage of this healthcare leadership model is that it uses the staff talents (individual), their teamwork potential (team) and the mission or mandate of the institutions such as delivering effective and efficient healthcare (tasks) in a balanced way and all targeted at achieving excellent patient outcomes (Results). As such, the leaders consider individual motivation factors (individuals) with the primary goals of ensuring good results, they deliberate on ideal teamwork procedures and communication channels (team), again with the primary goals of ensuring good results; and finally, they assign protocols on care provision in terms of correct procedures and processes (tasks) the primary goals of ensuring good results. Everything is easily configured towards one ultimate objective, that of achieving excellent patient outcomes. The Functional Results-Oriented model is supremely applicable in healthcare organizations, more so in governmental establishments. Its greatest advantage is that, it uses the staff talents (individual), their teamwork potential (team) and the mission or mandate of the institutions such as delivering effective and efficient healthcare (tasks) in a balanced way and all targeted at achieving excellent patient outcomes (Results). As such, tasks, individuals and teams become the foundation on which results are generated. Further research should be aimed at the usefulness of this model in private health establishments to examine its effectiveness. 1. Gardner G. Functional Leadership and Popularity in Small Groups. Hum Relat 1956;9:491-509 . 2. Kermally S. Gurus on People Management. London: Thorogood, 2005. 3. Hanson W, Randal F. Complexity and leader competencies in healthcare. British Journal of Healthcare Management 2011;17:284-290. 5. Adair J. Develop Your Leadership Skills: Develop Yourself as a Leader; Lead at a Strategic Level; Grow Leaders in Your Organisation. London: Kogan Page Publishers, 2010. 6. Eng RC. Mountaneering: Freedom of the Hills. Washington: The Mountaineers Books, 2010. 7. Heinemann, GD and A MZ. Team performance in health care: assessment and development. New York: Springer, 2002. 8. Hannah ST, Fred OW, Louis WF. Leadership in Action Teams: Team Leader and Members' Authenticity, Authenticity Strength, and Team Outcomes. Person Psychol 2011;64:771-802. 9. Clark, Jand Lynn C. Management for nurses and health care professionals. Edinburgh: Elsevier Health Sciences, 1997. 13. Shortell S. Health Care Management. Albany: Delmar Thompson Learning, 2006. 14. Rubin H, Pronovost P, Diette G. The advantages and disadvantages of process- based measures of health care quality. International Journal for Quality in Health 2001;13:4669-474. 15. Butler JR. The ethics of health care rationing. London: Cassell, 1999. 16. Gilmer T. The Costs of Non-beneficial Treatment in the Intensive Care Setting. Health Aff 2005;24:961-971 . 19. Jones R. Oxford textbook of primary medical care. Oxford: Oxford University Press, 2004. 20. Burns, LR, Elizabeth HB and Bryan JW. Shortell and Kaluzny's Healthcare Management: Organization Design and Behavior. Boston: Cengage Learning, 2011. 21. Manley K, Valerie W. International practice development in nursing and healthcare. Hoboken, NJ: John Wiley & Sons, 2008. 23. Buchbinder and Nancy HS. Introduction to Health Care Management. Burlington, MA: Jones & Bartlett Publishers, 2011. 25. Draper E. The company doctor: risk, responsibility, and corporate professionalism. New York: Russell Sage Foundation, 2003. 27. Marshall E, Joseph FC. Transformational Leadership in Nursing: From Expert Clinician to Influential Leader. New York: Springer Publishing Company, 2010. 28. Sines D, Mary S, Janice F. Community Health Care Nursing. Hoboken, NJ: John Wiley and Sons, 2009. 29. Hertz HS. Health Care Criteria for Performance Excellence. Washington: DIANE Publishing, 2000.